Summary: As they continued to revel in their excesses, enriching themselves at the expense of the poor and downtrodden, the elite of Israel had no idea that their celebrations were actually the beginnings of a funeral meal. The parties were, in reality, a wake for the coming demise of Joseph’s heirs and the doom of the Northern Kingdom. Text: [The Lord said,] “Woe to those who are at ease in Zion, and to those who feel secure on the mountain of Samaria, the notable men of the first of the nations, to whom the house of Israel comes! “Pass over to Calneh, and see, and from there go to Hamath the great; then go down to Gath of the Philistines. Are you better than these kingdoms? Or is their territory greater than your territory, O you who put far away the day of disaster and bring near the seat of violence? 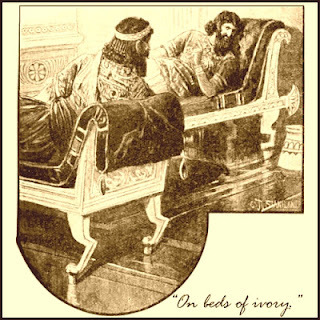 “Woe to those who lie on beds of ivory and stretch themselves out on their couches, and eat lambs from the flock and calves from the midst of the stall, who sing idle songs to the sound of the harp and like David invent for themselves instruments of music, who drink wine in bowls and anoint themselves with the finest oils, but are not grieved over the ruin of Joseph! Audio: Click to hear MP3 of A Wake for Joseph, preached to the saints of God at Faith Lutheran Church, Knob Noster, Missouri.